Broadcasting for TV and web! Six channel audiomixer with peaking meters and VST plugin support to use audio limiters and compressors! Bundle Campaign with 3 camcorder HD-SDI/HDMI PCIe INPUT cards! Buy CutFour HD 3.8 BUNDLE and get 3x HD-SDI/HDMI PCIe capture cards (3 live camera inputs)! 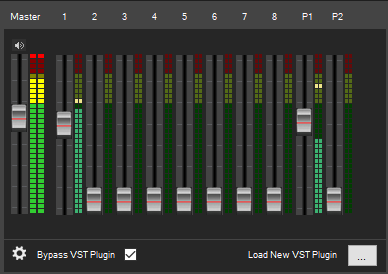 Easy to use mixing controls with great GUI! Several ways to control mixing: Click any preview window via mouse to cut, use control panel buttons or use keyboard shortcuts. Click left mouse button in any input preview window to do cut and right mouse button to do selected transition! This is really friendly and innovative way to do mix! Supports up to six live inputs from four Blackmagic Design video devices (not included). Up to 1920x1080 25P/30P/50i/60i. All Decklink cards, Intensity and Ultra Studio video devices are supported. Two Title channels over video with alpha channel support. You can use a third party application to make titles or images. 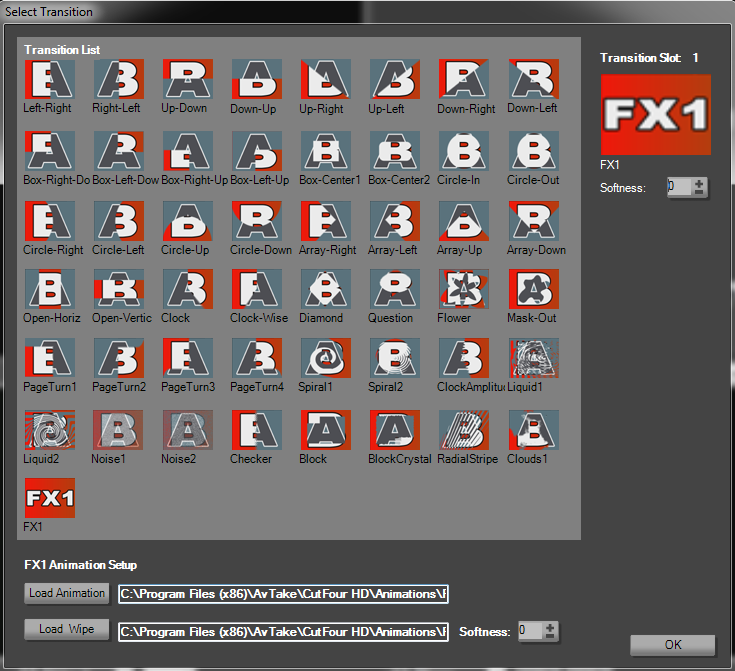 CutFour supports popular bitmap formats and PNG, TIFF and TGA formats with alpha channel support. 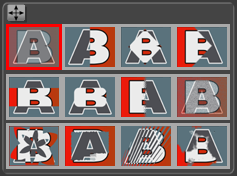 You can do overlay titles with Adobe PhotoShop or various title softwares. Titles have own bin window with slide show functions. Full quality AVI or MPEG2* file capture. You can record program to motion JPEG or uncompressed YUV AVI files or 50 Mbit MPEG-2. 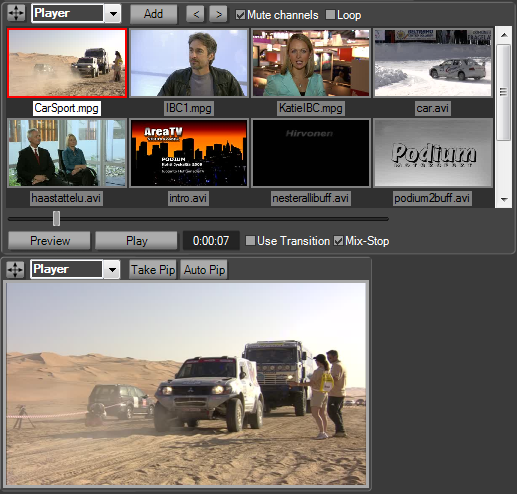 Picture in picture (PiP) , 7 channels with crop and soft edges. Four simultanous PiPs in HD with cropping and color edges (new)! Easy-to-use user-customized interface. Simple analog mixer style. Easy control with mouse or shortcuts. 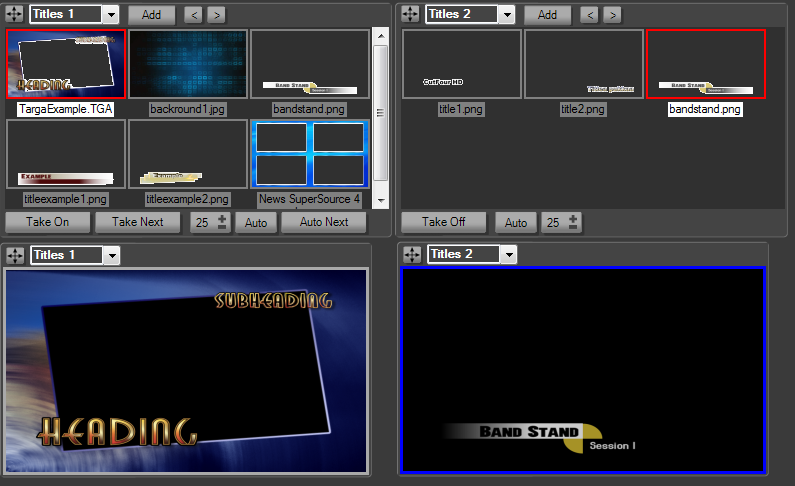 Preview to all video inputs. Scalable video windows for program and video inputs. Video insert player to program. 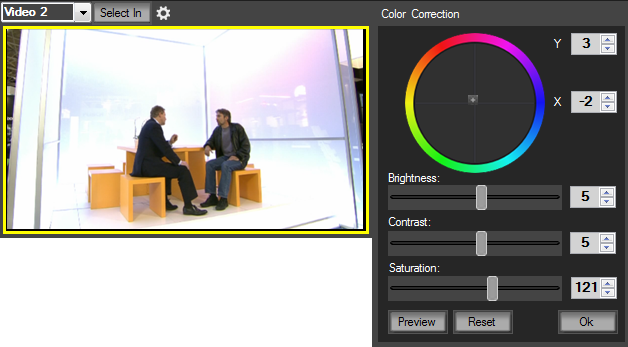 You can insert MPEG2,MPEG4 or MJPEG files to live program using direct cut or selected transition. Loop play support. 40 transitions: fades, wipes, animated wipes and stinger transitions. Cool stinger transition animation feature to use image sequence together with gradient wipe! Transition usage with control bar, Auto control via mouse and shorcuts. You can select your favorite transitions from Transition list to Transition panel. CutFour HD video/audio virtual output can be used with any Microsoft DirectShow full compatible application as a virtual DirectShow video/audio input device. For live camera inputs you will need 1 - 6pcs any Blackmagic Design video I/O devices. For example any Decklink, Intensity or Ultra Studio series capture card. Different device models can be mixed in same PC. Please check your mother board that it includes enough free PCIE slots. Multi channel cards Decklink DUO and Quad have supported too. Basic graphics card with hardware based DirectDraw overlay with 32-bit color. Intel i7 processor integrated craphic adapters are also supported. Two port display adapter is required to preview full screen video to projector. SATA 7200rpm or faster hard disk. SSD disk configuration recommended to system and video player. Copyright Avtake Oy 2015. All rights reserved.